Called From Here For Here, the project uses waste generated by current students to provide drawing tools for the whole college and next year's intake. Prin made the lead by combining clay from the ceramics department with liquid graphite from the glass department, or ink from the printmaking department with wax from the jewellery department. She then mixed sawdust with flour and water to make the casing and designed a simple device that extrudes both layers at the same time. Prin hopes the process will be adopted by future generations of students so that waste can be re-used on site and even earn the college some money through the sale of surplus pencils. Designers are best suited to methods of making that apply to specific and localized contexts. I believe design is about exploring the social and natural opportunities around us, taking advantage of every situation by connecting human activities with environmental principles. I am proposing a production system that treats the Royal College of Art as an experimental site for demonstrating these principles. It uses onsite waste as a raw material for a local pencil factory that will supply drawing tools to present and future students. “Sustainability is a development that meets the needs of the present without compromising the ability of future generations to meet their own needs.” World Commission on the Environment and Development, 1987. My interests are focused on the role of the designer and the process of producing objects which integrate ecological and cultural issues. Nowadays designers have a huge responsibility as we reach the limits of the world's resources: the incorporation of sustainability in production is unavoidable. Such concepts need to be entertained early in product design and not as an afterthought to a process. The Sustain talk IV on January 24th 2011 posed the question: How can the creative world engage with opportunities inherent in the social and natural world, to design a more sustainable way of life? I think the answer is in the way we make things. I believe designers should be aware of the product life-cycle, from the resource, to the fabrication, the energy used, the financial and social aspects, the distribution, the end-life and the locality. In other words, to include in the design process the “Cradle to Cradle” principles that have existed since the 1970’s even though the mainstream global trend is still to maintain the status quo, and industrial production works without environmental safety in mind. Instead, we not only have to brave the design of an object but the design of its whole system. In such a context: What to create? For whom? With what? My response is to imagine a system based on useful products which are produced specifically for a site with the waste generated there. I am looking for legitimacy of creating objects which I can justify by maintaining the enjoyment of making without the guilt. Through my project, I am trying to find the correct approach of making. I believe designers have to show a good example to their clients, the industry, and consumers by bringing eco-effectiveness into their projects. We have to be self-governing and not wait for others to do something about the problems we face. But, in order to change the big system, we have to start locally and create localised solutions. We have to look for fairness of production according to this already saturated world, simply because designers are the guardians of the future. I am proposing a production system that treats the Royal College of Art as an experimental site for demonstrating these principles. It uses onsite waste as a raw material for a local a pencil production that will supply drawing tools to students of this year and years to come. In this case, waste is not discarded but recycled into something useful. We can do more with less by "closing the loop" in production, a useful exercise for the RCA itself. By the integration of a product policy during the creative process, we will end up with a more appropriate model that can incorporate all environmental, social, cultural and economical considerations. And finally generate a self-reliant production that can engender a mini economy on site. The RCA includes 22 departments and all of them have different types of waste. The opportunity is to see the potential in that waste when they are combined and reintroduced into a daily useful object, according to the identity of the place involved. Here, the pencil acts as an emblem for an art school. Let’s start with the workshop I know the most because I work there every day. The wood workshop produces a big bag of unrecycled sawdust daily. I see in this a remarkable raw material. 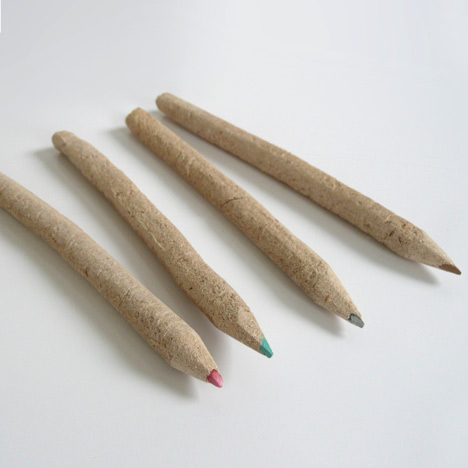 The bodies of the pencils are made out this wood dust mixed with flour from the canteen as a binding agent and water. After a long period of experimentation, I discovered it was possible to use clay from the Ceramics department with liquid graphite from the Glass department or ink from the Printmaking department with wax from the Jewellery department for the lead. It was very important for me to keep the number of inputs for the pencil recipe to the strict minimum, so they could be easily reproduced. The RCA has 1044 students and 370 employees and my goal is to create the opportunity for everyone to own a pencil. That is where the co-extruder operates because it creates the adapted process of production for the adapted number of objects needed. This tool that extrudes the body and the rod of the pencils at the same time, is designing a reconstruction process that considers waste a resource. It provides a homemade autonomous product production for local regeneration. I consider that my challenge as a product designer is not to design objects as masterpieces, but to go beyond that by creating the instruments that will endure and help a community to solve their problems. The idea is to perform a production during the RCA Final Show by engaging people and encouraging students and staff to keep going with this sustainable practice. This installation is built on people’s growing awareness of social and environmental concerns, and their roles as consumers. This is the social and cooperative side of this project which talks about the interdisciplinary nature of the departments which are connected through the recycling. In the context of the Show, the visitors will animate the production of a unified output. There is still a massive educational job to do to raise the consciousness of waste reuse, slow design and low-energy production, especially in the framework of a school; because individual actions are often determined by local infrastructure. With this tool, people now take the control of their production and consumption, via a decentralised organisation. The “From Here For Here” system presents itself as a small, local, connected, cooperative and open scenario. But now, if we think more widely, one wood dust bag can produce 90 pencils, there are approximately 5 of them a week. They make 170 bags a year – therefore 15,300 pencils. This production could consequently be used to raise income for the RCA and be viable economically. This system could also be extended to create other suitable products by using other RCA waste. Another scenario could be to provide a service by renting co-extruders to other wood workshops. The council could organize a big wood dust collect in a city, and hire the machine to schools in order to educate children about sustainable behavior while creating their pencils at the same time. And we can think even more widely when we know that at least 200 million cubic meters of wood chips and sawdust are produced in the world, just within the sawing lumber industry. The limit is only one of our imagination. Now I am asking you: Do we need to pay for raw material when we have a considerable amount of waste? Do the next generations have to pay for our mistakes if we can start doing something now? We must be conscious of the difficulties faced by design today but see its extraordinary potential as well. With these pencils I am trying to draw the big picture of a new model of society. For this project I have work with Engineers Benjamin Males and Nick Williamson, both tutors at the RCA, together with Rafael Gomes Fernandes, Postgraduate Research student in Turbulence, Mixing and Flow Control and Conan Hales, Master student in Environmental Technology both from the Imperial College. My two years tutors Daniel Charny and Roberto Feo, who helped me to find who I am and what I want. I thank them all very much indeed.